Bioconjugation methods are critical for the stable conjugation of metallic and nonmetallic radionuclides to biomolecular targeting vectors. In contrast to the radiosynthesis of most small molecule tracers, the creation of biomolecular imaging agents typically employs biomolecules in their native form, eschews protective groups, and generally involves no more than one or two steps. Because the majority of biomolecules contain not only different functional groups but also multiple copies thereof at different positions, particular attention has to be paid to the chemoselectivity and site-specificity of bioconjugation reactions. In addition, the sensitivity of many biomolecules frequently means that mild aqueous reaction conditions must be used, a requirement which imposes further restrictions on radiolabeling protocols. Taken together, these factors combine to make the controlled functionalization of biomolecules a non-trivial task. 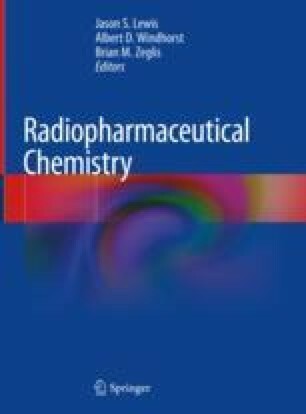 In this chapter, we discuss the various bioconjugation methods that have been harnessed for the development of biomolecular radiopharmaceuticals. Several classical approaches based on bifunctional reactive probes will be discussed as well as a number of more recently developed strategies employing enzymes and biorthogonal chemistry. The strengths and limitations of each approach will be addressed, and examples of the application of each strategy to different classes of biomolecules will be provided.